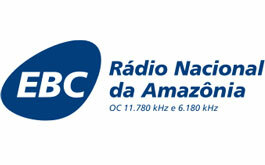 This past weekend, Radio Nacional da Amazonia had a booming signal into North America on 11,780 kHz. I recorded their broadcast throughout the night, assuming it would eventually fade; however, it did not. So, if you're in the mood for some Brazilian music and commentary today, this eight-hour recording of Radio Nacional da Amazonia should satisfy. Note to those subscribed to our podcast: I was a bit reluctant to include a link to the podcast feed as this file is so large; I rarely make eight-hour recordings. I did offer it up, however, based on the fact that there are so many other podcasters who regularly serve up files in excess of 250 MB. If you believe this file is too large to be included as a podcast, please comment; I certainly don't want to choke up your bandwidth or overwhelm your iPod! But it's wonderful listening.